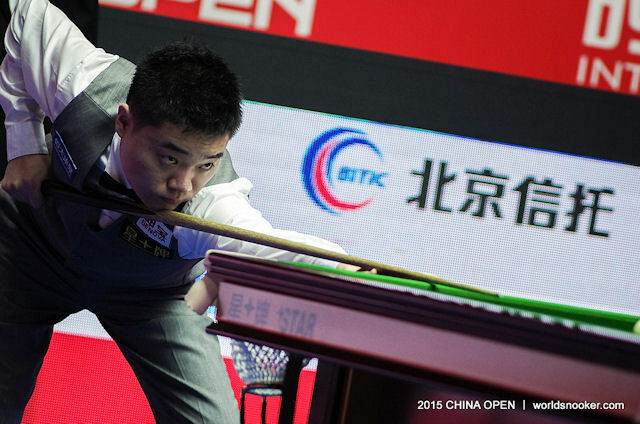 Ding Junhui played his best snooker of recent weeks in a 5-1 thrashing of Mark Davis to reach the last 16 of the Baic Motor China Open. China’s top player has suffered a series of early exits from major tournaments this season, but could yet finish the campaign strongly. Defending champion Ding, celebrating his 28th birthday today, knocked in breaks of 86,86 and 66 in a fine display against Davis. Michael White and Robert Milkins are set for a last 16 showdown which will end the loser’s hopes of qualifying automatically for the Betfred World Championship. The winner will still have a chance to jump into the 16th and last seeding position. Indian Open champion White edged out Stuart Bingham 5-4 thanks to a break of 53 in the decider. Milkins came from 4-1 down to beat Zak Surety 5-4, making an 80 in the decider. Stephen Maguire remained in control of the destiny of that 16th seeding position by coming from 4-2 down to beat Ryan Day 5-4, making a vital clearance from last red to pink in the decider. Mark Selby eased fears of a recurrence of his 2012 neck injury by beating Elliot Slessor 5-0 with a top break of 126. Judd Trump cruised to a 5-1 win over Peter Ebdon with top runs of 52, 66 and 127. He will now meet John Higgins, who won a Scottish derby against Graeme Dott 5-2 with a top break of 58. Masters champion Shaun Murphy came from 4-3 down to beat Anthony McGill 5-4, finishing strongly with breaks of 113 and 72 in the last two frames.